The two friends and first doubles pairing won the South Jersey Interscholastic Championships doubles tournament on Sept. 30. 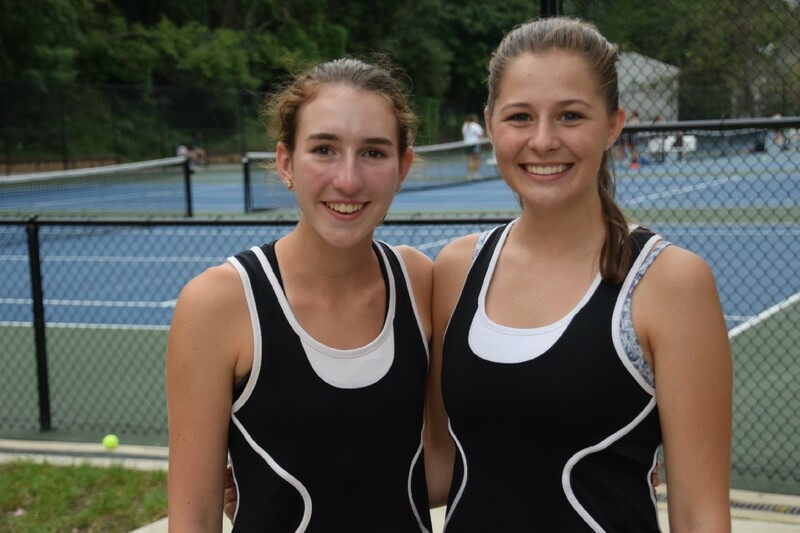 Juniors Anna Swartley and Stella DeMarco are not just doubles partners for Haddonfield Memorial High School girls tennis. They’re close friends who met in elementary school and developed a bond over a sport neither player was good at. Swartley and DeMarco aren’t just a little bit better at tennis, they’re one of South Jersey’s top doubles teams this season. On Sept. 30, the duo won the 2018 South Jersey Interscholastic Championships doubles title, defeating Moorestown High School’s Paige O’Neil and Eliza Broder in the finals. Swartley and DeMarco pulled off the feat despite having only played with each other this year for about a week prior to the start of the tournament. Swartley was out for about two weeks at the start of 2018 due to an ankle injury she suffered toward the end of the team’s preseason challenge matches. Despite the injury, Swartley was able to hit the ground running with DeMarco upon her return to the court in mid-September. Both players said there was practically no transition period when the two were paired together, as they had played doubles together two years prior as freshmen and also played some matches together as sophomores in 2017. “It just came back together like a puzzle,” Swartley said. Swartley and DeMarco weren’t always Haddonfield’s top doubles players, but were able to earn valuable experience as young players. Head coach Jeff Holman uses some of the Bulldawgs’ regular season matches as opportunities to get younger players some time in the varsity lineup. Swartley and DeMarco played a few matches together on varsity as freshmen and both feel that experience was crucial to their development. Swartley and DeMarco have opposite playing styles. Swartley is at her best playing up at the net, while DeMarco’s strongest aspect is her speed and ability to keep the ball in play. “When she’s at the net, she gets every single net ball,” DeMarco said about Swartley. The pair admits they didn’t enter the SJIC Tournament with concrete expectations, especially with the duo having so little playing time together this season. In the first three rounds, Haddonfield dropped only three games combined. After defeating Cherry Hill High School East’s first doubles team in the semifinals, Swartley and DeMarco faced Moorestown’s O’Neil and Broder in what they said was their toughest match of the tournament. Swartley and DeMarco knew what Moorestown was thinking with both players playing at the baseline. The Haddonfield duo uses the same strategy against certain opponents. In the second set, Swartley and DeMarco lost only one game and won the match, 6–4 6–1, to clinch the title. Swartley said she was happy to be able to get Haddonfield a win in the tournament and was excited to see many of their teammates come out to support the duo.